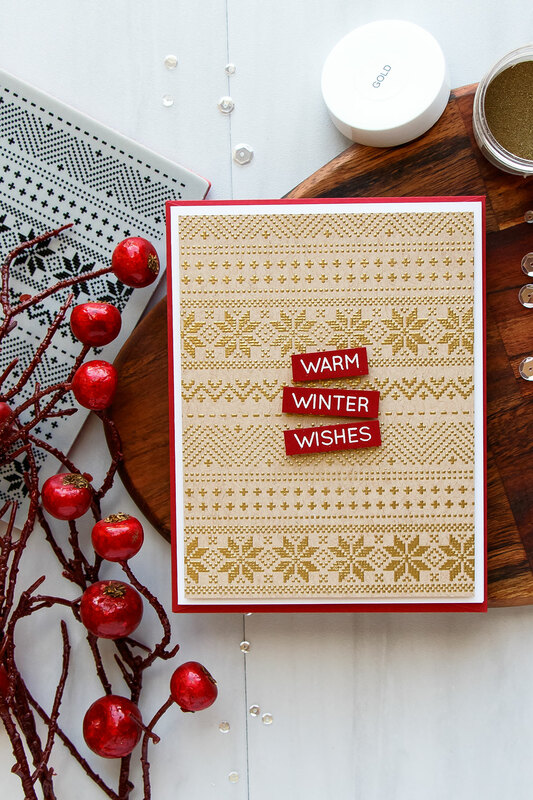 The Christmas Sweater background stamp from Simon Says Stamp is my absolute favorite (after the Kaleidoscope Leaves and Carol Singers lol) from the 2017 STAMPtember release (I’m pretty sure I’ll have a few more favorites as new products appear during this month, but for now – it’s definitely the Christmas Sweater). This stamp very much reminds me of traditional Ukrainian cross stitch embroidery and, being Ukrainian, feels so very dear and close to me (I’ll share some inspiration photos at the end of this post). 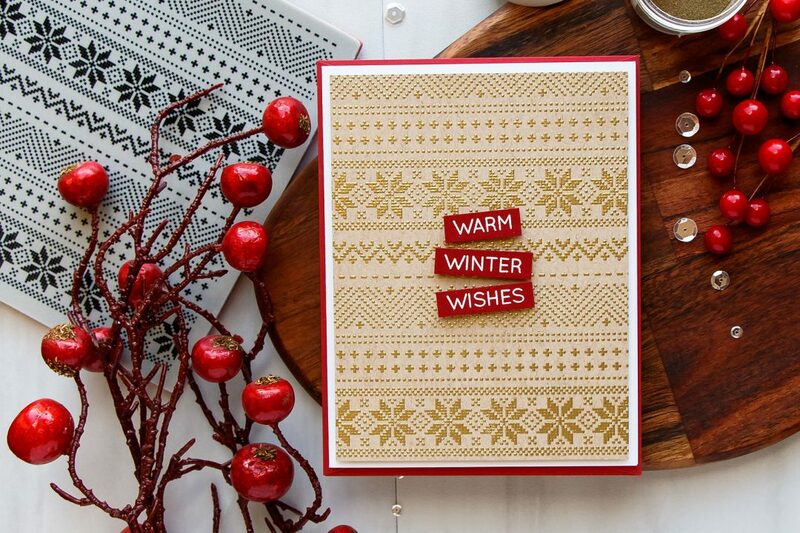 I started working on this card by heat embossing Christmas Sweater background in Gold embossing powder onto kraft cardstock. I used my MISTI to make it easier to stamp it and also to be able to double stamp it for perfect impression. I trimmed my panel to 4 x 5 1/4″ and foam mounted onto a white A2 side folding card base (I have switched to a different paper trimmer now and thus can’t cut my paper to create top folding cards, so I’m making side folding these days – they are just as nice!). To create a sentiment for this project I looked for a message that would have a word “warm” in it, since the background is reminiscent of a sweater I wanted my message to go well with the print. I picked one that reads “Warm Winter Wishes” from the Ready Set Snow set. 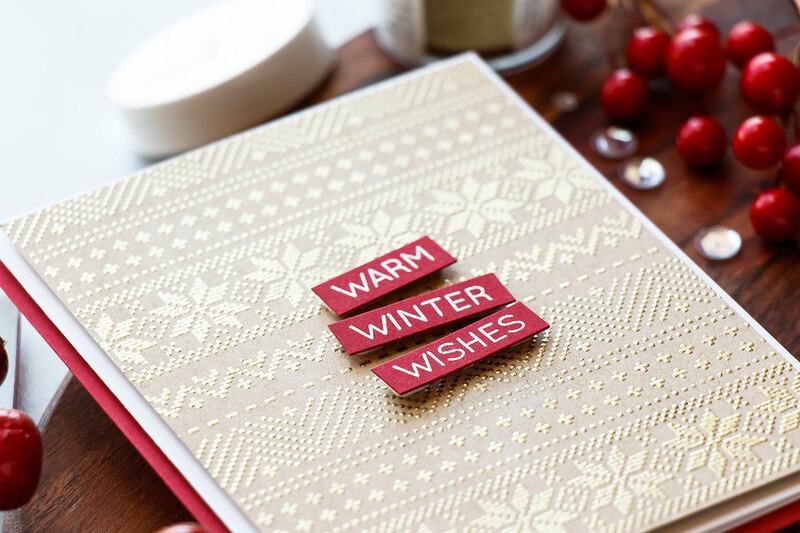 I heat embossed sentiment in white embossing powder onto Schoolhouse Red cardstock, cut into a strip, cut each word apart and foam mounted onto the card at an angle. Here’s another project I made using this background stamp. 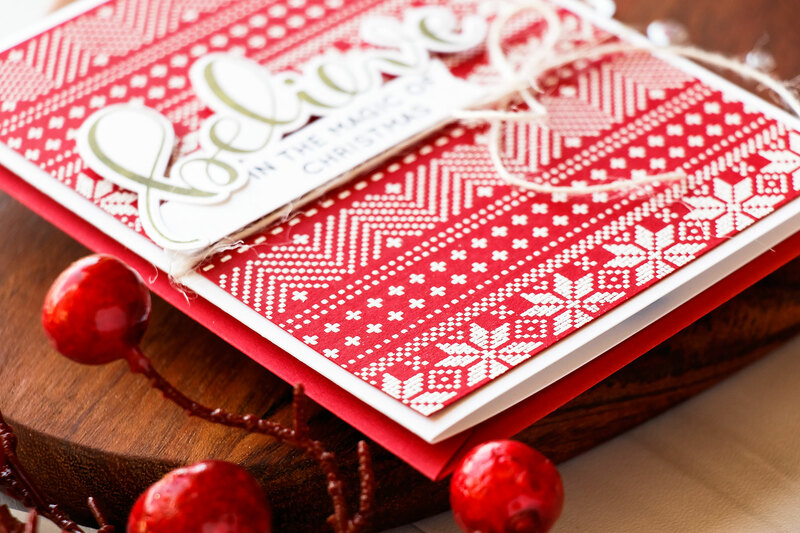 I heat embossed it in white onto red cardstock for a completely different look. This, I feel, looks a lot more festive. 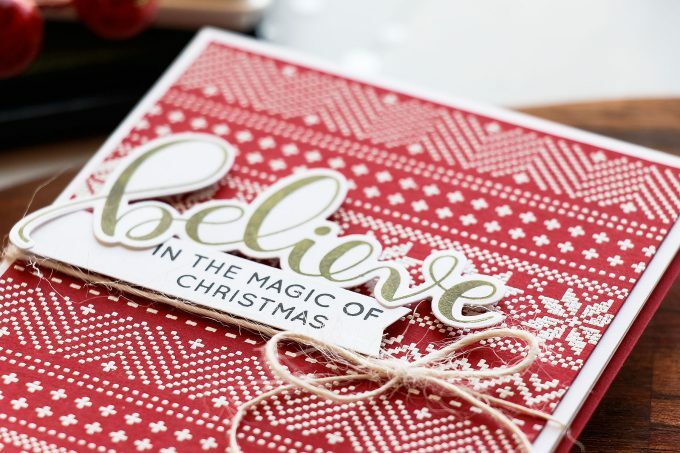 To create a sentiment for this card I stamped and cut out the word “Believe” (Willow ink color was used for stamping) and also stamped “In The Magic Of Christmas” in black ink onto a strip of cardstock and foam mounted both onto background. Lastly, I added a bit of natural twine although this card looks just as nice without it. I love love love the Christmas sweater backdround and the believe wafer die! Absolutely amazing cards! Thankyou for the inspiration. It still amazes me how many different looks one can get from just one stamp! I agree as well that the stamp looks so much like a sweater design! I’m from the east coast and I used to see this sweater design back there (it must be a very popular design!!). The black, red, white colors with the design are SO pretty and dynamic! That I’ve NOT seen before!! Thanks, Yana! PS – Thank you for sharing a little bit about Ukrainian culture! Absolutely gorgeous, Yana! I love cross-stitch; I LOVE your card featuring this faux cross-stitching stamp! You’ve just ‘enabled’ another addition to my shopping list! Really pretty. Love that stamp. These are beautiful! Love the Christmas sweater look. 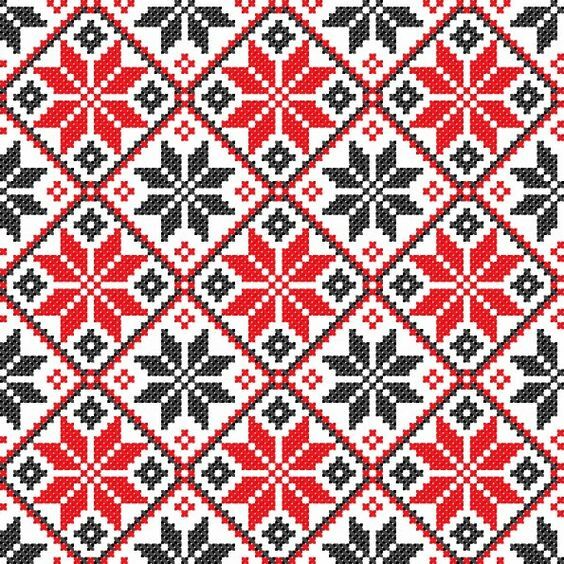 I love what you have done with the tiny little dots and details of the Christmas sweater pattern! These are both really, really, beautiful! Masterpiece! The background stamp in gold is so beautiful, and the white on red looks so wonderfully festive! 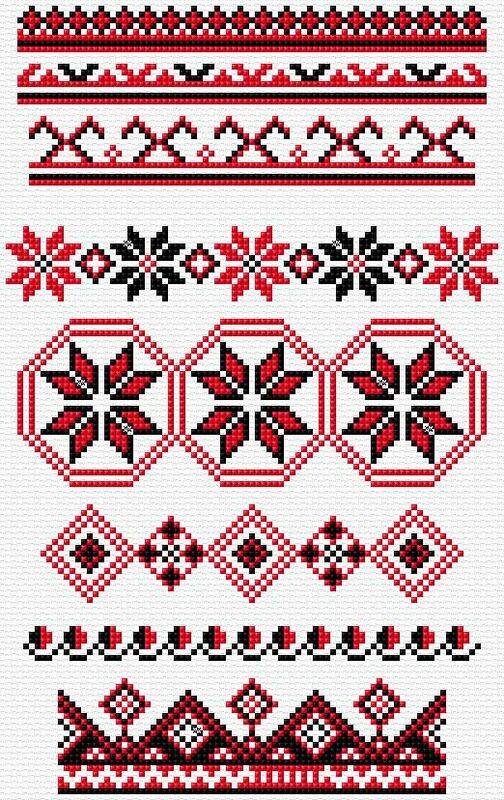 I love that you shared some images of the cross stitch in red/black on white. How wonderful! Thanks for sharing and inspiring! Love the gold on kraft paper. Very pretty! 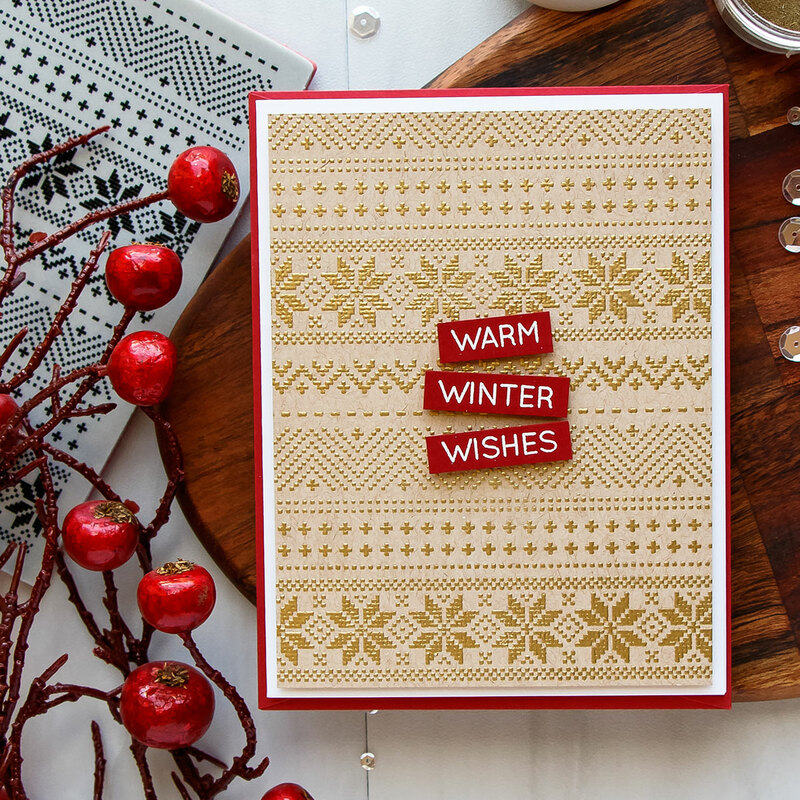 Thanks for sharing this lovely card design and your sweater story. Isn’t it fun how we can relate something in our lives to a stamp? Love how you used the red cardstock and embossed in white! WOW! These cards use minimal supplies but they make a big impact. Thanks for sharing your inspiration and a little bit of your tradition as well, Yana. Love the sweater backgrounds! Wonderful products in this release and great ideas from you designers – thanks! WOW! So simple and stunning! These cards are so pretty and festive. I think the red one is my favorite. Wonderful designs Yana! And yes the background looks similar to the Ukrainian Xstitch patterns you shared. Thanks for the inspiration! Really like the “Believe” on the sweater background! Love all of the versions of this card. The gold embossing on the kraft cardstock is my favourite – love the warmth of it. Both of your cards feel festive to me! TY! So beautiful cards, this stamp is my favorite from the new release!! Those cards are beautiful! The sweater background is so pretty! This background stamp is one of my favourites as well. 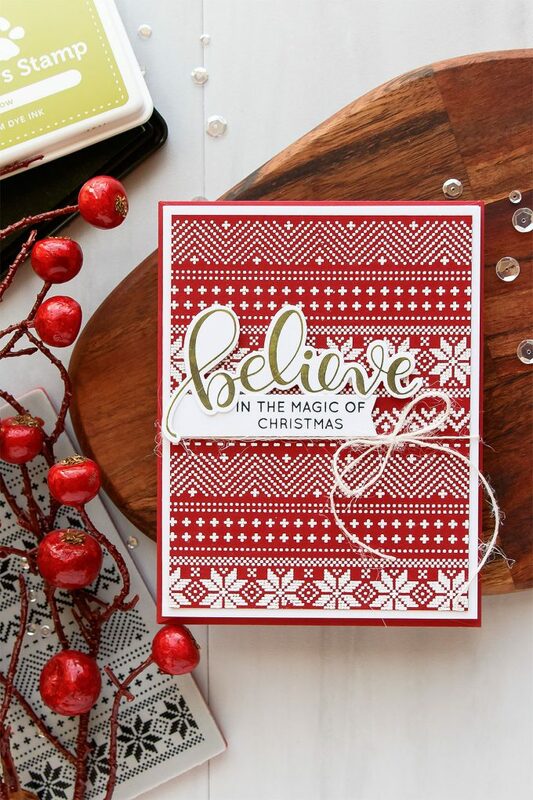 Love the look with embossing you’ve done. Creates beautiful simple cards. Love how you combined old products with the new Christmas sweater background stamp!! Thanks for sharing!! Beautiful! And I love your pictures at the end. Surprising what a difference changing the ink can make. Love this cards! Gorgeous technique! the result is amazing, lovely cards. I forget to emboss on colors cardstock…thank you! Beautiful cards. Upon seeing the reveal of this stamp, I too thought of a sweater pattern. I love the diversity you shared with us between the two colors, both are beautiful and warm. 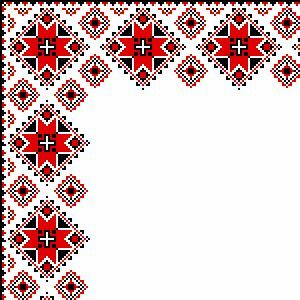 Thank you for sharing the three Ukrainian patterns too. Lovely card, and yes, the 2 embroideries do look similar. I love all of the cards you made. Your choice of colors is perfect and inspires me to give it a try. I used to knit sweaters, etc. with some of these exact patterns. Now I can do it making cards. I am 85 yrs. old and learning more every day from inspirational people like you. 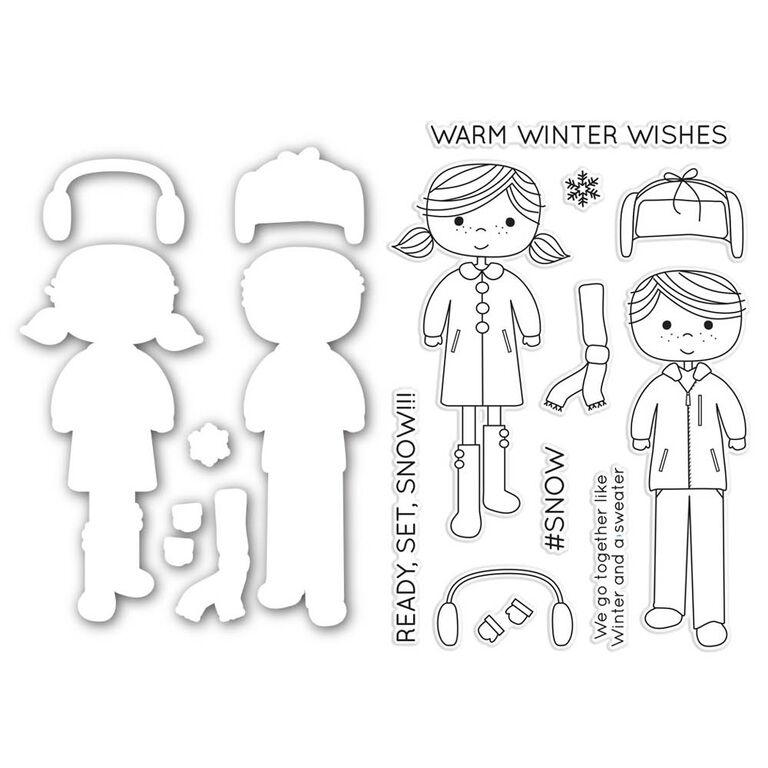 TFS your God given talent with the paper crafting world. Beautiful cards. I especially love the red one as it is so festive looking. 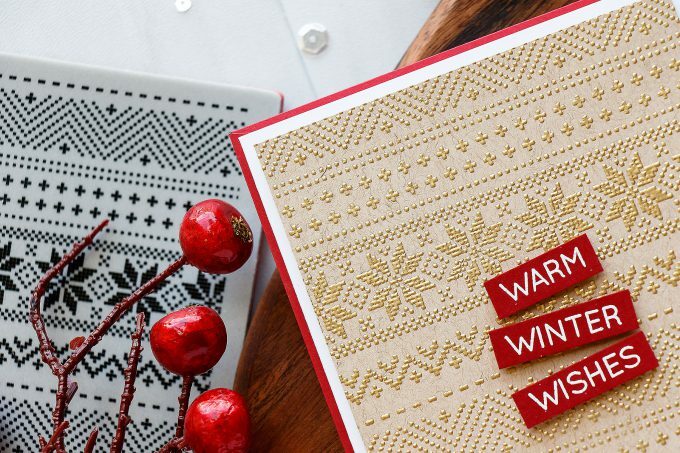 Love these cards, the idea to make them look like christmas sweaters is so cute! Beautiful cards Yana, I esp. love the colours of the first one, it is amazingly beautiful! I adore the warmth of the sweater background. There’s something really homely about that cable knit look. Stunning. So rich and love the colors. Oooh! That cross stitch background is so pretty! 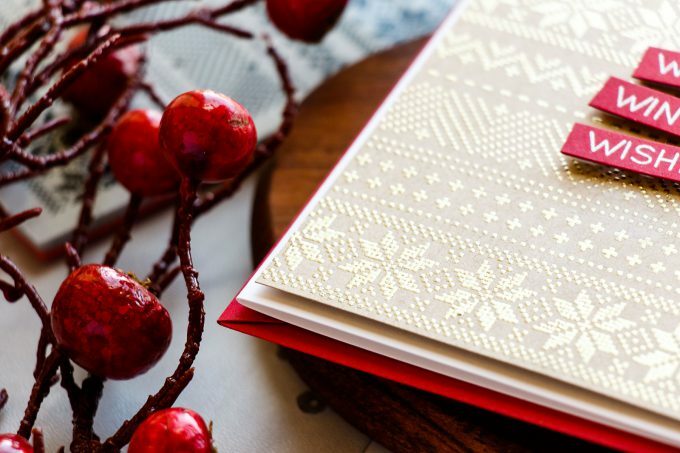 It looks great with the gold embossing. Such beautiful winter cards! I love, love, love the red one especially! Love these cards..reminds me of Christmas in the country. beautiful cards! such an inspiration and totally loving the sweater background!